This page is intended for physicians only. Please consult professional medical service providers for further information. Worldwide, doctors accept trabeculectomy as the gold standard procedure. ologen™ CM has the potential to significantly lower traditional complication rates associated with trabeculectomy. Trabeculectomy is the most commonly practiced surgical procedure for uncontrolled treated glaucoma patients. During glaucoma filtering surgery, conjunctival, scleral, and trabdoor scarring nevertheless remain an obstacle to a successful surgery. Therefore, a new, safe and effective treatment for trabeculectomy is much called upon, which could be made possible with the help of ologen™ Collagen Matrix. Schematic illustration of the surgical procedures of using ologen™ CM in trabeculectomy. Preparation of the conjunctival and scleral flaps. Create a tunnel beneath the scleral flap. Suture the scleral flap loosely with a single stitch. Place ologen™ CM directly on the top of the scleral flap. The volume of ologen™ Collagen Matrix creates a functional bleb which maintains a physiological barrier in the subconjunctival space that prevents subconjunctival scar formation. The porous structure of the collagen matrix induces random growth of the fibroblasts into the porous structure to prevent scar formation and to modulate the wound healing process. ologen™ Collagen Matrix has a superior water-absorbing abilityand an excellent pliable strength. When ologen™ Collagen Matrix absorbs aqueous humor, it works like a reservoir and creates a tamponading effect on the scleral flap, which along with the use of a loose suture on the scleral flap maintains a dynamic controlled drainage of the aqueous humor outflow. These properties further prevent scar formation in the trabdoor and intra-scleral space and reduce the chances of hypotony which may be seen in trabeculectomy with the applications of anti-metabolites adjuncts before ologen™ Collagen Matrix can be applied. Cover the plate. Possible mechanism of action: as adjuvant for GDD surgery to prevent hypertensive phase by promoting a better Bleb. 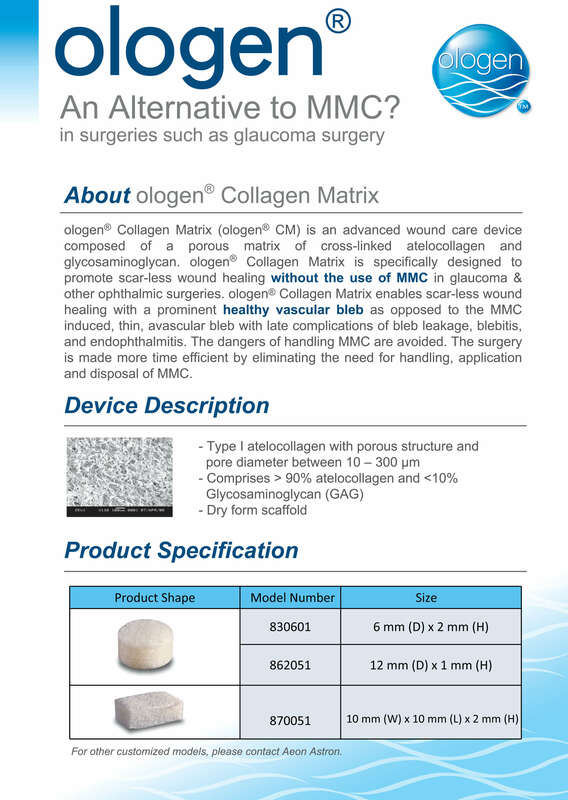 ologen™ collagen matrix may be used as an antifibrotic agent in many different ophthalmic surgeries. The collagen matrix is highly porous and biodegradable. It can modulate ocular tissue repair via wound modulation and randomization of the collagen formation to promote wound healing. With high risk patients, you may consider using the collagen matrix with other anti-scarring adjuvants (separate procedures), such as MMC. In this case the MMC concentration and application time may be adjusted to eq. 0.1 mg/ml for 1 minute. Do not soak the collagen matrix in MMC, as it will affect the functionality of the collagen matrix. Post-operative digital massage combined with 5-FU or MMC injection may be used when the collagen matrix is initially implanted but is still unable to satisfactorily reduce unexpected post-operative scarring. The post-operative IOP reduction is a direct result of the surgery, not the collagen matrix itself and may be adjusted by the techniques in the next section. Dada T, Kusumesh R, Bali SJ, Sharma S, Sobti A, Arora V, Panda A. Trabeculectomy With Combined Use of Subconjunctival Collagen Implant and Low-dose Mitomycin C. J Glaucoma, 10 Oct 2012. How can I optimize my trabeculectomy with ologen™ Collagen Matrix? 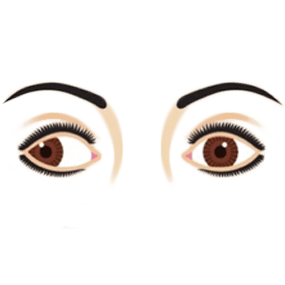 Position of surgical site: the superior half of the globe is recommended, as this position may minimize the incident of complications with the protection of eyelid. Limbus-based flap: you may use ologen™ Collagen Matrix Model 830601 (6*2 mm) or Model 862051 (12*1 mm) according to your preference. Fornix-based flap: if you choose Model 862051 (12*1 mm), you may need to trim or temporarily fold the collagen matrix for ease of the insertion into the subconjunctival space. With side incisions cut right to the limbus: the anterior flow of aqueous humor may be more prominent and may lead to more anterior focal bleb. You may consider placing ologen™ Collagen Matrix slightly to the anterior on the top of the closed scleral flap (please also refer to section “The closure of scleral flap” for surgical techniques). With side incisions limited to 1-2mm posterior to the limbus: the posterior flow of aqueous humor may be more prominent and may lead to more posterior diffuse bleb. You may consider placing ologen™ Collagen Matrix slightly to the posterior on the top of the closed scleral flap. The scleral flap should be created with moderate thickness. However, ologen™ Collagen Matrix itself is a good patch graft to reinforce a thin or weak scleral flap, and may prevent scleral flap dehiscence or shrinkage, if a thin or weak sclera was found intra-operatively. It is recommended that the scleral flap is closed with 1-2 loose-to-moderate/ releasable sutures. This technique is critical to optimize the glaucoma surgery, because the collagen matrix will exhibit a tamponading effect with an additional pressure of 0.5-5 mmHg. Do not tie the flap with further and tighter sutures as you would with MMC. The aggressiveness of the surgical manipulation should be in accordance with the target IOP that you would like to achieve for each individual patient. The tighter and the additional scleral flap sutures you use, the higher the post-operative IOP and the chances of post-operative scarring. Collagen matrix does not have to directly cover the whole of the scleral flap’s incisions. Fibroblasts would be guided into the collagen matrix to achieve the effects of wound modulation and randomization of the collagen formation. We recommend removing/releasing the sutures within 2 weeks. Do not wait until a few months as with MMC. When using tighter and additional scleral flap sutures, you should lyse or release the sutures earlier than you normally would. The rationale is to reduce the time and chances of wound adhesion that may close up the transscleral fistula, if indeed more or tighter scleral sutures are used instead of the recommended 1-2 loose to moderate sutures. Is hypotony a concern if I use 1-2 loose sutures to close the scleral flap with ologen™ Collagen Matrix on top? When ologen™ Collagen Matrix is placed on the top of the scleral flap, it will exhibit a tamponading effect with an additional pressure of 0.5-5 mmHg. The collagen matrix can act as a dynamic buffering system to prevent clinically significant hypotony. If transient early hypotony occurs, it usually resolves in 5-10 days. Simply monitor IOP if a flat anterior chamber (flat AC) does not develop and VA is not affected. For cases with grade II flat AC, you may use lenses, viscoelastic injection into AC, and/or compression sutures to manage the wound, whilst avoiding suturing over the collagen matrix. Can I use ologen™ Collagen Matrix when buttonholes develop? When buttonholes develop, we recommended you do not use antimetabolite (alkylating agent) such as MMC, or that you avoid it coming into contact with the buttonholes. ologen™ Collagen Matrix itself is a good patch graft to reinforce the repair of buttonholes as it does not interfere with tissue healing. However, it is recommended you do not expose the collagen matrix through unclosed buttonholes or suture over the collagen matrix with transconjunctival compression sutures in order to prevent infections. While in harmony with the use of the collagen matrix, buttonholes may be excised or closed with adjacent conjunctiva onto the cornea or sclera, or further sealed with the covering of Tenon’s, if present. Single placement on the top of the scleral flap (as in trabeculectomy). Follow your routine device implantation/ canaloplasty procedure or viscoelastic injection in the deep scleral excision space. Single placement in the deep scleral excision space; you may trim the collagen matrix to fit into the space. Double placement in the above two compartments. This may prevent both subconjunctival and subscleral scarring. Aptel F, Dumas S, Denis P. Ultrasound biomicroscopy and optical coherence tomography imaging of filtering blebs after deep sclerectomy with new collagen implant.Eur J Ophthalmol2009; 19: 223-30. Tarek Shaarawy, Tanuj Dada, Shibal Bhartiya. ISGS Textbook of Glaucoma Surgery, Ch.40. Jaypee, 2014. For revision cases with antimetabolite related hypotony3 and leak6, ologen™ Collagen Matrix is a good revision surgery solution as it exhibits a tamponading effect with an additional pressure of 0.5-5 mmHg. The collagen matrix acts as a dynamic buffering system to prevent further hypotony. When using transconjunctival compression sutures, avoid suturing over the collagen matrix. For revision cases with subconjunctival fibrosis where buttonholes are likely to develop due to a weakened tissue, the collagen matrix is a good patch graft to reinforce and protect the weakened conjunctiva. The collagen matrix is superior to other donor grafts due to its pliancy and flexibility and is less likely to cause irritation or bulky stress to conjunctiva. For revision cases with encapsulation or with the closure of transscleral fistula, the scleral tissue is sometimes weakened due to the extensive revision manipulation required. ologen™ Collagen Matrix is a good patch graft to reinforce the scleral tissue as it is applied in the repair of scleral thinning, and may prevent scleral flap dehiscence or shrinkage in these revision cases. Please refer to the section “How can I optimize my trabeculectomy with ologen™ Collagen Matrix?” for related surgical techniques if a bleb is to be created at the original revision site. Oluwatosin Smith, David Godfrey, Davinder Grover, Michelle Butler, Ronald Fellman. Surgical Outcomes Following the Use of a Biodegradable Subconjunctival Collagen-Glycosaminoglycan Matrix in Revisions of Late-Onset Glaucoma Filtering Bleb Leaks. Poster 40 at the 2014 AGS Annual Meeting, Washington DC. 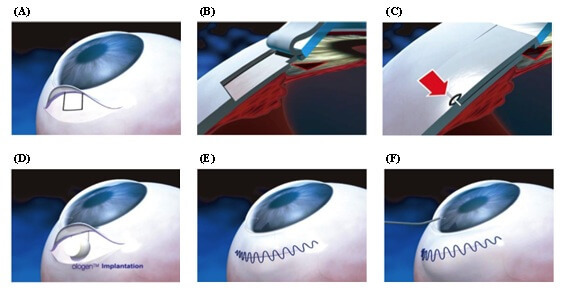 It is proposed that the collagen matrix can be used as patch graft to cover the tube of various glaucoma drainage devices, in combination with, or as an alternative to donor grafts for tube exposure repair,. The collagen matrix is more flexible, is pliable, and is less likely to cause irritation or bulky stress to conjunctiva. The collagen matrix may be applied during the repair of scleral thinningr, in primary cases, or in the secondary cases associated with the use of MMC. The collagen matrix can also be applied in pterygium excision to prevent pterygium recurrence when the use of MMC/ irradiation is not recommended. ologen™ Collagen Matrix is synthesized from SPF (specific pathogen free) porcine origin. It does not have a stromal/ epithelial side and may be applied both ways. John Stephens. Collagen Matrix (Ologen) as a Patch Graft in Glaucoma Tube Shunt Surgery. Poster 16 at the 2014 AGS Annual Meeting, Washington DC. Stirbu Oana, Jorge Vila. Tube Exposure Repair. Journal of Current Glaucoma Practice, 2012; 6(3): 139-142. Rosentreter A, Mellein AC, Konen WW, Dietlein TS. Capsule excision and ologenTM implantation for revision after glaucoma drainage device surgery.Graefes Arch Clin Exp Ophthalmol2010; 248: 1319-24. Sangchul Yoon, Kyoung Yul Seo. P116 Biodegradable implant for tissue repair for scleromalacia treatment. The 2013 Annual Meeting of the Korean Ophthalmological Society (KOS), Seoul, Korea. Eun Young Cho, Sang-Bumm Lee. P277 Novel Surgical Therapy Using Biodegradable Collagen Matrix for Ocular Surface Reconstruction of Scleral Thinning after Pterygium Excision. The 2013 KOS. What affects the degradation time of ologen™ Collagen Matrix? Inflammation: the collagen matrix may degrade faster in cases such as revision surgery, neovascular glaucoma, uveitic glaucoma, or where clinically significant postoperative inflammation is involved. In such cases, the collagen matrix could dissolve within 90 days. 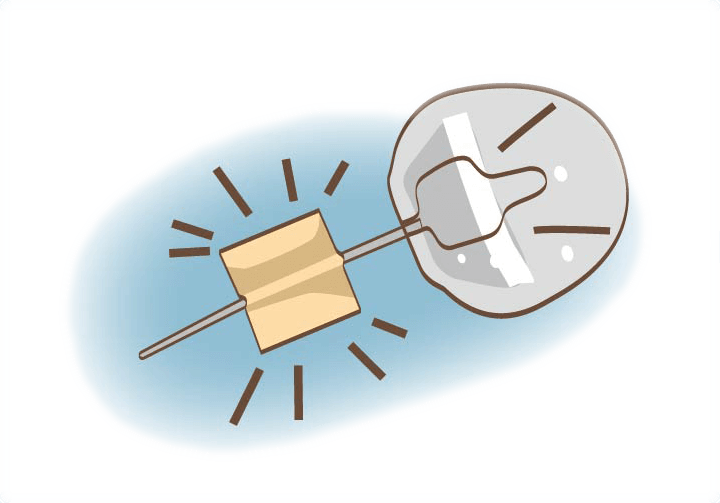 The degree of filtration: it is proposed that overfiltration may lead to a shorter degradation time, while under-filtration and the use of steroid/ MMC may lead to a longer degradation time. Also, the collagen matrix may last longer when applied as patch graft in indications where no filtration of aqueous humor is involved. Leaving in its wake the patient’s own connective tissue to repair and protect the intended area. ologen™ Collagen Matrix is biocompatible; its biosafety is proven by more than 20,000 cases of surgery worldwide. Communication with the patients is essential to help them understand that the collagen matrix may harmlessly remain in the eye for a reasonable time range. Aeon Astron Europe B.V. was incorporated in February 2008 in Leiden, the Netherlands. ologen™ Collagen Matrix has been approved by Taiwan Food and Drug Administration (TFDA). ologen™ Collagen Matrix Implantation is viable to assist Treatment of Scleromalacia after Periocular Surgery. 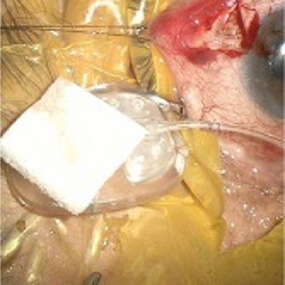 A RETROSPECTIVE STUDY DISCOVERED 41.7% HIGHER RATE OF COMPLETE SUCCESS OF OLOGEN-AUGMENTED AHMED GLAUCOMA VALVE IMPLANTATION THAN CONVENTIONAL METHOD. © Copyright | Aeon Astron Europe B.V.
ologen Collagen Matrix is not available in all countries. The product information of ologen Collagen Matrix shown on the website is provided according to CE approved instruction for use.